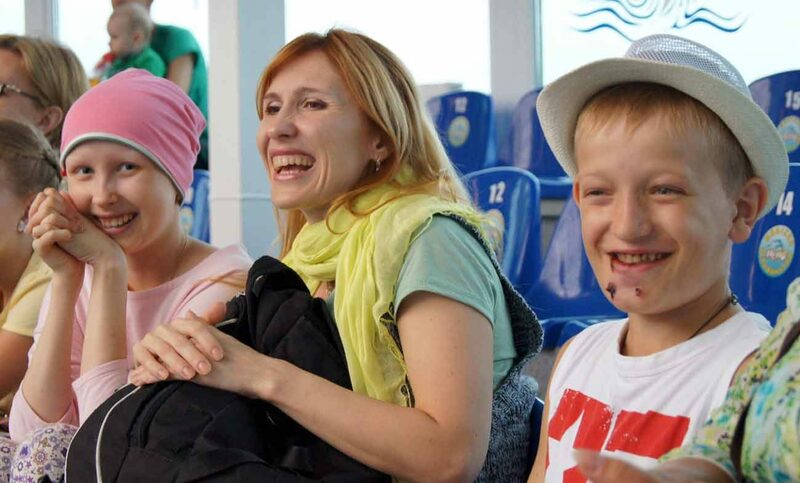 LVIV, Ukraine (CNS) — Svetlana Kudriavets had never worked with children with cancer when she became the coordinator of St. Luke Social and Rehabilitation Center in Lieskauka, Belarus, last year. Now she feels that the work with these special children is particularly rewarding. With the help of the local Caritas agency, St. Luke Social and Rehabilitation Center was opened in 2003 as a housing facility for children who undergo treatment in the nearby Belarusian Research Center for Pediatric Oncology, Hematology and Immunology in Minsk, believed to be one of the world’s biggest hospitals for children with cancer. Childhood cancer became an acute issue in Belarus after the Chernobyl nuclear disaster in 1986, during which the country was exposed to large amounts of radiation. Every year some 300–350 children in Belarus are diagnosed with a cancer, and many are treated at the Minsk hospital. However, there are not enough housing facilities for children and their parents. Families with a sick child often have no money to rent an apartment close to the hospital. St. Luke’s offers free housing for 19 families — a child and one parent. Preference is given to underprivileged families, children who need treatment for long periods, and those who live in remote areas of the country. Caritas coordinates its activity with the state hospital. If the state hospital provides treatment, St. Luke’s Center offers the positive emotions and atmosphere to speed up the recovery through workshops, art therapy, feasts and plays. Team member rejoice with the parents when children recover. In addition to coordinating the center’s 30 regular volunteers, Kudriavets works with different volunteer groups from the universities and other organizations, for example hospital clowns. Caritas of Minsk-Mohilev Archdiocese has different programs for children with cancer, disabilities and sensory processing disorders. The agency hopes to launch a special room in St. Luke’s to help children develop their sensory skills in a calm and friendly atmosphere. The U.S. Conference of the Catholic Bishops Office of Aid to the Church in Central and Eastern Europe is funding equipment needed for the room. Caritas actively works with the children who live in Lieskauka and in Minsk. This year the agency is planning joint mini-vacations for children with disabilities and healthy children. He said he believes that children need to learn the solidarity and understand that children with disabilities have the same rights as healthy ones. He told of one 10-year-old girl who expressed her wish to be a volunteer in the center, together with her friends. “I don’t have plan for them yet, but I will come up with a one,” he told CNS with a chuckle. Brother Zhylevich said as he travels across Belarus visiting orphanages and nursing homes, he sees other needs. For instance, Caritas is hoping to establish a system of warm-meal delivery for the homeless in Minsk. Brother Zhylevich said he believes that it’s important to spread the word about Caritas activities. “We need to shout around about the good things. We often hear about tragedies, terrors, deaths, and the good is so shy and humble that people don’t notice it. We need to talk about the good to make it contagious. Young people try to find their place in life. The good needs to take place in their souls,” he said.